2011 marks the sixth straight season that the NFL is serving up a Thanksgiving Tripleheader to its fans, and that begs the question: how did we ever live with only two games/season? A couple of years ago, fans began clamoring to go against the tradition of Dallas and (more specifically) Detroit hosting every season because of perennially bad play and holiday blowouts. The resurgent play of both teams, however, has this year’s Turkey Day slate looking as fine as any we’ve seen since the inception of the NFL Network’s nightcap. While the locations of the first two games are National Football League institutions: Detroit’s been hosting since 1945 and Dallas since 1966 (with a few exceptions for both), the third game has yet to land in the same place twice. This year, in addition to the Green Bay Packers at Detroit Lions and the Miami Dolphins at Dallas Cowboys games, the San Francisco 49ers at Baltimore Ravens matchup is selected to finish the day. We’re going to handle the holiday lineup in the same way any good all-day eater handles the family buffet, in several trips. 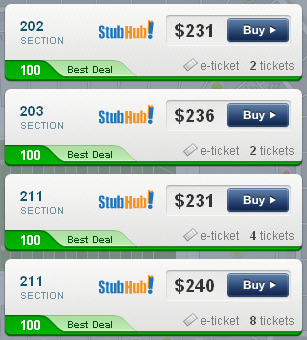 Check out the average prices for all three games below and then read about the first course: Packers vs Lions. This divisional matchup was, for a time, the mandated Thanksgiving Game in the 1950s. Since then, the Lions have faced another divisional rival, Chicago, almost as often as the Packers. This year’s game features two of the most dynamic offenses in the league and a home crowd eager to see their Lions end a holiday losing streak that started in 2004. After a decade of futility, Detroit finished last year very strong and started 2011 with a great deal of fanfare. The team long-considered a pushover now offers a worthy main course for the Thanksgiving lineup as they welcome the defending Super Bowl champions to the Motor City. The Lions offense is powered by quarterback Matthew Stafford and a cast of weapons at the skill positions including all-world receiver Calvin Johnson and matchup nightmare Brandon Pettigrew at tight end. While running back Jahvid Best will not play in this game due to a concussion, Detroit has demonstrated the ability to overcome adversity this season and will not use his absence as an excuse. While some teams may dread the short week of preparation for this game, Stafford and his teammates have to be eager to put last week’s debacle in Chicago behind them; the quarterback threw two interceptions that were returned for touchdowns, and the special teams surrendered a return for a touchdown by the always dangerous Devin Hester. Detroit’s defense will attempt to set the tone versus the seemingly unstoppable attack of the Green Bay Packers. To date, the Lions are ranked fourth in the league in passing defense and will need their best game to slow down Aaron Rodgers, Greg Jennings, Jermichael Finley and the other dangerous receivers and running backs on the Green Bay squad. Ndamukong Suh, Kyle Vanden Bosch, and Cliff Avril will work their hardest to pressure Rodgers and a secondary anchored by Chris Houston will look to prevent the Packers receivers from breaking loose on a big play. While the Green Bay offense gets most of the publicity – and a stat line like Rodgers’s deserves such acclaim – the key to the Packers hopes of an undefeated season is on the other side of the ball. After winning a shootout against the New Orleans Saints on opening night, Green Bay’s ability to make a defensive stop when it counts has been questioned. Two of their last four games – versus St. Louis and Minnesota – have had flashes of the big play potential that helped win last year’s Super Bowl as a wild card, with linebacker Clay Matthews and defensive back Charles Woodson leading the way. Despite these recent stands, the Packers passing defense is still ranked next to last in the league, and this first game of two versus the Lions this season presents another difficult challenge for the entire roster. Because a Green Bay Packers at Detroit Lions game is steeped in such tradition, especially on Thanksgiving, getting Packers-Lions tickets may seem like a daunting task. SeatGeek can check all of the best ticket listing sites at once and sort out the Best Deal for you; start your search for Green Bay at Detroit tickets with these highlights and find the best place to celebrate the holiday watching your favorite team live! 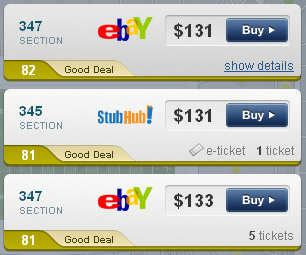 The average ticket for this game, even though it’s the only divisional rivalry of the day and the most established of the games, is actually the cheapest right now at $183. Standing Room Only (SRO) tickets often offer the best value for last-minute admission to the game, and you can get one for Packers-Lions for as low as $87, though most run around $110. If SRO isn’t your style, the cheapest seats you’ll find are in the Upper Deck of the end zone (sections 345 and 347) for $131. That’s over 28% cheaper than average! The Best Deal according to SeatGeek’s Deal Score will get you a seat in the second deck of Ford Field around the goal line for $231 (sections 202 and 211). Yes, that’s 26% more than average, but it’s still a great value considering the view. 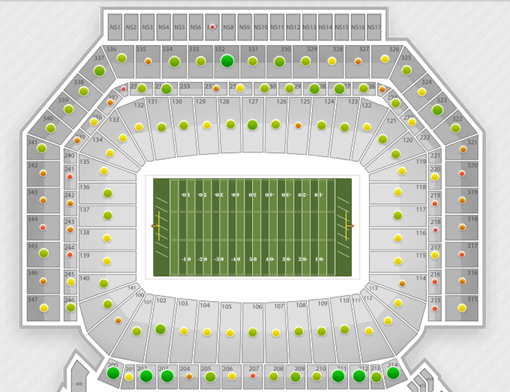 Finally, if your way of giving thanks to yourself or your friends/family is the most expensive seat in the house, look no further than section 132 in the corner of the endzone, where a set of 8 tickets is currently listed for $5,503 each! If you want to claim you paid that much for the sake of your ego, listings in that same section are starting as low as $205. So, there’s your first helping of the NFL Tripleheader: a nice plate of turkey, stuffing and potatoes smothered in gravy. That sounds about right for a smashmouth Midwest rivalry, right? If you have any questions about Packers at Lions tickets, contact us on twitter @SeatGeek or write chad@seatgeek.com. Have a great holiday!